I am selling an iPhone case with a screen protector. My attachment: "iphone and case" is the primary image you will be editing. All of the others are for your reference. 1) Remove all 6 bubble bumper edges on the corners. Look at file "instructions" for visual guide. 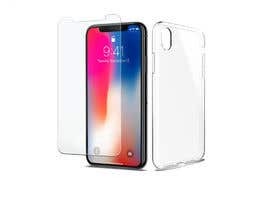 Finished result should look like file "Clear case without bumper example"
2) After you remove bumpers, you should illustrate and insert the glass screen protector into the image. The screen protector will be standing up, and to the right of the iphone case. I have attached 5 images of screen protector. You can cut out any 1 of the screen protectors from these references, or you can illustrate your own. Please see file "instructions for screen protector" for visual instructions. 3) Photo editing. Enhance just a little bit. Add some light reflection and shadow effect. Should look clear and sharp. The finished image will include: iPhone, iPhone Case, iPhone Screen Protector. Refer to image "instructions" for visual instructions. You will make edits on the file called "iphone and case". 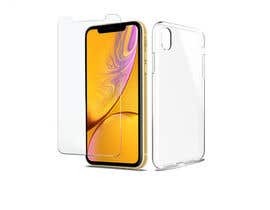 If you want inspiration for what I am looking for, search "iPhone XR clear case" on Amazon. My goal is to make my main image just like my top competitors. If this helps, imagine that Apple was selling this product. How would it look? Good luck and please let me know if you have questions! The Worst place for professionals to enter contests. Check my entry #48..I am sure my work must be like you. Me too, but really i see you deserve it. that you made, it finishing in less than 5 mins.